I've been wondering how much we, Filipino taxpayers, pay for all those climate alarmism. LIke the creation of more climate bureaucracies -- last year alone, they created at least 2 new bureaucracies, the Climate Change Commission (CCC) and Renewable Energy Commission (REC). Then there are climate change task forces or offices at some provincial governments, city governments, and municipal governments. Then there are endless climate loans, courtesy of the WB, ADB, OECF (Japan) and other foreign aid bodies. These are several billion dollars of new loans by the Philippines alone for environment and energy sectors to reduce carbon emission, to "fight climate change." Then there are endless global climate meetings. I dont know how many climate officials the Philippine government sent to Copenhagen last year. And there are bi-monthly global meetings prior to Copenhagen, prior to Cancun. ... and the launching of processes for mitigation and finance," said Antonio G. M. La Viña, Ateneo School of Government dean and a member of the 51-man Philippine delegation, in an e-mail to BusinessWorld. Wow, 51 climate officials and negotiators! I would assume that all of them are government officials, not including environmental NGO leaders. Because if that is the case, we ask -- Do we taxpayers pay for the plane fare, hotel, other expenses of fellow private citizens attending governmental functions? The COP 16 meeting is held in the luxurious Moon Palace Hotel in Cancun, here. See more pictures of the hotel and brief discussion at Cancun capitalism vs. climate socialism. The Mexican government would spend about $67 million for hosting the event alone. Individual bills of participants not included yet. 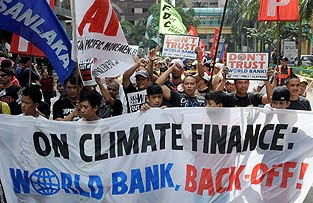 Meanwhile, there was a demonstration yesterday in front of the WB Manila office, where climate activists do not want climate loans dispenser WB to take charge of climate loans racket. What? These two groups should be hugging each other. One group wants more money and climate loans for "climate justice" lobby, the other group wants more governments borrowers to "save the planet." And then again and again, we keep asking, everyday, every month, every year -- Is the planet burning? Does it have a high fever? Is the continiously rising? 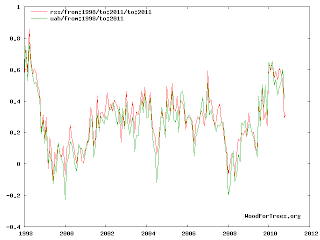 Where is "unequivocal warming"? 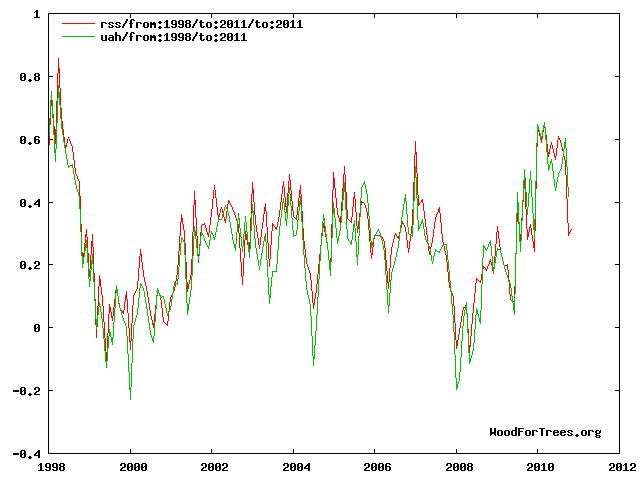 CO2 concentration in the atmosphere keep rising, from about 365 parts per million (ppm) in 1998 to 390 ppm this year. By AGW theory of more carbon emission, more warming, then global temperature should be rising in step with CO2 level in the atmosphere. The rise in CO2 is there, almost linear rise. Where is the warming? Prolonged drought and bad El Nino is due to man-made warming. Prolonged rains and winter, and bad La nina is also due to man-made warming. Is climate science = political science?